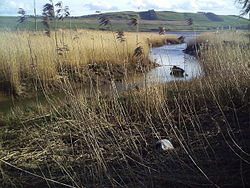 Reeds growing in saltmarsh in the estuary of the River Tay. Cape thatching reed (Elegia tectorum), a restio originating from the South-western Cape, South Africa. Thatching reed (Thamnochortus insignis), another restio species originating from the same geographic region. Many cultures have used reeds in construction of buildings of various types. Phragmites australis, the common reed, is used in many areas for thatching roofs. In the United Kingdom, common reed used for this purpose is known as "Norfolk reed" or "water reed". However, "wheat reed" and "Devon reed" are not in fact reed at all, but long-stemmed wheat straw. Wikisource has the text of the 1911 Encyclopædia Britannica article Reed.